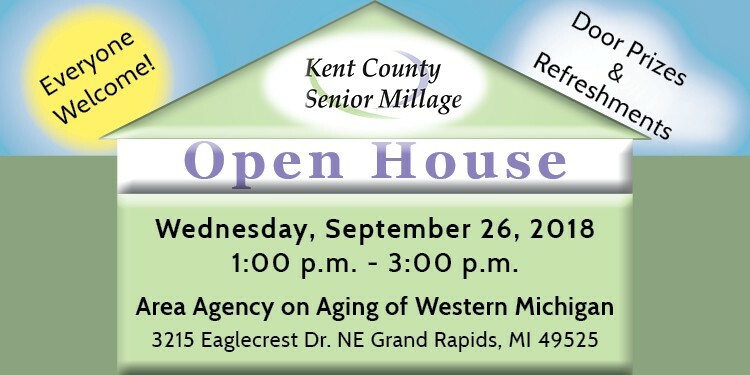 Join us for the Kent County Senior Millage Open House on Wednesday, September 26th from 1:00 - 3:00 p.m. Explore Kent County Senior Millage (KCSM) services available to older adults and caregivers. Meet with all of the KCSM service partners to discuss services and get questions answered. This event is free with light refreshments and door prizes! The open house will take place at Area Agency on Aging of Western Michigan located at 3215 Eaglecrest Dr. NE, Grand Rapids, MI 49525. Contact us with any questions (616) 456-5664 or aaainfo@aaawm.org. Invite family and friends by downloading our flyer here!